Deborah Rose launches her new album “Wilde Wood” by performing with two different line ups and singing with a very special guest. A celebration of local talent and a triumph for all concerned. Welsh born, Worcestershire based singer, guitarist and songwriter Deborah Rose has been a frequent presence on the Jazzmann web pages for a number of years, sometimes under her previous name of Deborah Hodgson. Blessed with a stunningly pure voice and an innate musicality her love of words, song and singing has found her exploring the worlds of folk, jazz and Americana with a variety of collaborators including local gypsy jazz guitar wizard Remi Harris. Following a number of self produced EPs Rose released her first full length album, “Song Be My Soul”, in early 2014, a charming collection of self penned songs combined with settings of the words of poets and authors such as Tennyson, Shakespeare, Dickens, Blake and Christina Rossetti. The follow up, “Wilde Wood” couldn’t be more different as Rose abandons her literary leanings and explores the world of Celtic folk music in the company of locally based musicians from two different groups, The O’ Farrells Frolicks and Grey Wolf. 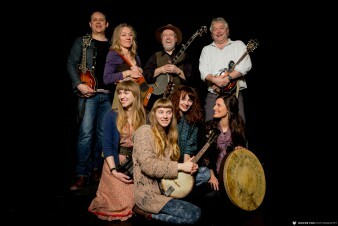 The O’ Farrells are an all female family folk group based in Bewdley, Worcestershire. Mother and multi intrumentalist Lindsay Farrell (whistles, bodhran, fiddle, accordion), is joined by her three talented daughters Mari Randle (guitar, vocals), Hetty Randle (banjelele, ukelele) and Lucy Randle (melodeon, concertina). The family’s roots in Co. Cork are reflected in their love of Irish traditional music and the quartet play regular gigs and sessions in the pubs of Worcestershire and the West Midlands. But the Randle sisters are more than just friendly folkies, Mari (guitar, vocals) and Hetty are also part of the alternative rock trio Vault Of Eagles where Hetty plays electric bass alongside powerhouse drummer Scott Ewings .The music is loud, grungy and heavy and the trio have built up a considerable following. Grey Wolf are an acoustic trio based in Ludlow, Shropshire who specialise in “old time” Americana, particularly the folk music of the Appalachians, much of which was descended from the music of Scottish and Irish settlers, thus maintaining that all important Celtic connection. Beginning as a duo featuring Martin Thomas (guitar, mandolin, vocals) and Jim Allen aka Banjo Jim (banjo, guitar, vocals) the group have developed rapidly since their inception, widening their repertoire, adding the services of fiddler Ben Walsh and recording a full length album entitled “Red Eye”. Like Rose herself Allen is a skilled organiser and used to co-ordinate The Floor, the much missed monthly musical review that used to take place at St. Michaels Village Hall near Tenbury Wells. An early incarnation of Grey Wolf often supported such top quality headliners as Rose, Remi Harris, blues guitarist/vocalist Eddie Martin and Oysterband guitarist Alan Prosser. Prior to the recording of “Wilde Wood” Rose rehearsed intensively but separately with both groups. Refreshments during the rehearsals with the O’Farrells tended to be tea and cakes (well they did first meet in a coffee shop in Bewdley) while the Grey Wolves preferred something a little stronger, usually red wine or even a bottle of brandy. The album occasionally features members of both groups playing alongside each other although in the main it divides into O’Farrells songs and Grey Wolf songs and the record also includes backing vocals by a very special guest but I’ll come to that later. The material is mainly comprised of well known tunes, many of them folk club staples, but the joyousness and spontaneity of the performances plus the undoubted quality of Rose’s voice ensures that it still makes for a very rewarding listen. Given her folk background I was rather surprised at how many of these tunes were actually new to Rose, but perhaps that’s what helps to keep the music fresh. Tonight’s show at Artrix, Bromsgrove’s flourishing theatre and arts centre was the official launch date for the album. Rose is a performer who is much loved in her local area and the auditorium was virtually sold out with many of the singer’s friends and family present in the crowd. You could feel the goodwill. Virtually all the material from “Wilde Wood” was performed together with a couple of favourite songs from “Song Be My Soul” plus various items from the repertoires of both the O’Farrells and the Grey Wolves. Deborah Rose remained on stage for almost the entire performance which began in a duo format with Rose accompanied by the burly, tattooed figure of Matt Worley, aka Matt The Stringman. Worley is the proprietor of Strings & Things, a guitar shop in Stourport on Severn and is also involved in a project to restore the former Swan Hotel in Stourport as a music venue. He proved to be a most supportive and sympathetic foil to Rose’s crystalline voice as she sang “Taigh Allainn” (Gaelic for “House Beautiful”) and “Lady of Shallot”, two of her favourite items from “Song Be My Soul”, the former a paean to the peace and solitude of the Scottish Hebrides, the latter a setting of Tennyson’s words by Rose and Worcester based pianist Ian King. The arrangement”Foggy Dew”, a traditional Irish tune with lyrics inspired by the 1916 Easter Rising featured guitar, banjalele and melodeon plus Lindsay Farrell moving from whistle to bodhran and Mari Randle adding harmony vocals. as the song gained impetus. Lindsay Farrell played fiddle on an as yet unrecorded arrangement of “Scarborough Fair”, combining well with daughters Mari on guitar and Lucy on concertina as Rose delivered the lyrical litany of impossible tasks. “Hands”, written by Jewel Kilcher was performed as a duet with Mari Randle with both musicians playing guitar and combining on the vocal harmonies. The American born Kilcher who performs under the single name of Jewel is something of a polymath, a singer, songwriter, actress, author and activist. Rose has named her as a significant influence upon her own music making. The lively “Dance Of The Rabbits”, a French jig that somehow found its way to Ireland and thence to Bewdley demonstrated the instrumental abilities of the O’Farrells with Lindsay and Lucy on twin squeeze boxes, accordion and melodeon respectively. “Rocky Road To Dublin” then featured the lead vocals of Mari Randle on a second item from the Frolicks repertoire. Deborah Rose and Mari Randle then shared the vocals on a cover of Bob Dylan’s “One More Cup Of Coffee”, a more pared down, less apocalyptic version of the original. The song also featured a fiddle solo from Lindsay Farrell who plays with the instrument resting on her knee rather than under the chin in the classical manner. It’s the kind of rustic approach that I seem to recall also being deployed by Norwegian Hardanger fiddlers. To close the first set Matt the Stringman returned to accompany Rose on her beautiful interpretation of the jazz standard “Autumn Leaves” delivered in the style of the late Eva Cassidy – alongside Judy Collins one of Rose’s key musical inspirations. The second half began with the Grey Wolf trio who opened with a breezy “old time” style instrumental featuring fiddle, guitar and banjo. Allen then switched to guitar and Thomas to mandolin, the latter also handling the lead vocal on “Orange Blossom Special”, one of several “old train songs” in the trio’s repertoire. Rose then joined the trio to sing a version of the traditional spiritual “Bright Morning Star”, a song I know best from Oysterband’s accapella rendition on their 2002 album “Rise Above”. Featuring guitar, banjo and fiddle and with Thomas and Allen sharing the vocal this version was substantially different and deployed a slightly different lyric to the Oysters version. Next came “Cuckoo”, a traditional Appalachian song, sometimes known as “Jack of Diamonds”. This piece offered a good demonstration of Allen’s banjo skills, he’s now considered to be one of the best exponents of the frailing and clawhammer styles in the country and is a respected teacher of the instrument. “Blackwaterside” is an absolute folk staple (again I love the Oysterband version) and has been extensively recorded my many leading figures of the genre. With her beautiful voice Rose was still able to bring something fresh to this enduring folk classic. Martin Thomas took over the vocal duties for “Raleigh and Spencer” , a tale of gluttony and alcohol in two towns in North Carolina and West Virginia. Fiddler Ben Walsh also showed up well. Like Mari and Hetty Randle he’s another musician with a double life thanks to his role with the electro folk band Plaid. Rose resumed vocal duties for “If I Could Only Fly”, a song written by Blaze Floey and made famous by Merle Haggard. With Thomas playing keening slide guitar this piece took Rose and Grey Wolf deeper into conventional Nashville style country territory. The traditional “Banks Of The Ohio” was once a hit Olivia Newton John. A cheerfully melodic song with a grisly lyric the Grey Wolves suggested that it was probably “the sweetest murder ballad ever”. Rose’s voice combined with those of Thomas and Allen in an accapella section and there was also a fiddle solo from the impressive Walsh who has done much to enhance the Grey Wolf sound. As a group they’ve improved hugely from those early days at The Floor and have clearly developed a strong following for their respectful and authoritative approach to traditional American music. A segue of “Mrs McLeod’s Reel” and “Sandy River Belle” offered the Grey Wolves the opportunity to demonstrate their instrumental chops before Walsh switched to mandolin and Allen and Thomas both took up guitars as Rose sang the wistful “Little Bird”. The traditional staple “Little Maggie” then ended the set on an energetic note with Thomas switching between guitar and mandolin and Allen again demonstrating his banjo credentials with an absorbing solo. As stated previously there was a lot of love in the hall and an encore was almost inevitable as the audience gave the performers a terrific reception. What happened next was almost certainly a complete surprise to almost everybody. Led Zeppelin vocal legend Robert Plant took to the stage to sing in duet with Rose on the old pop hit “Love Hurts” with Worley accompanying them on guitar. I knew that Rose and Plant were well acquainted, he’d been in the audience at one her previous shows at this venue, but even so I wasn’t expecting this. I never though I’d ever see Robert Plant sing live, I missed out on Led Zep back in the day and there was no way I could afford the re-union tickets so this was an incredible bonus. When Plant got to the line “I’m Young, I Know” he rolled his eyes theatrically and instigated a laugh out loud moment which endeared him to everybody even more. I’ve never met Robert Plant but he’s a great supporter of local music and always seems a thoroughly decent chap. When I attended a charity event organised by Rose at the Regal in Tenbury Wells on 2014, a show that also featured the O’Farrell’s, he sent along a load of signed merchandise for the raffle – and no, I wasn’t lucky enough to win anything. I think he’d actually been scheduled to play then but was instead obliged to make a live TV appearance on The One Show on the same evening. But tonight was essentially a celebration of local talent and the vibrancy of the music scene in this part of the Midlands. Plant’s contribution was just the icing on a very tasty cake. Even without him this had been a very satisfying evening of music and a triumph for all concerned. Deborah Rose is now set to take her “Wilde Wood” show to the Regal in Tenbury Wells on Saturday 6th June 2015 with O’Farrells Frolicks and Grey Wolf again appearing. I don’t think there are any guarantees about Robert Plant though.